Cas-ual Fridays is hosting a really fun challenge this week called Love Letters. The challenge is to create a clean and simple project that feature your letters in a creative way. I paired up two different stamp sets to create my card. 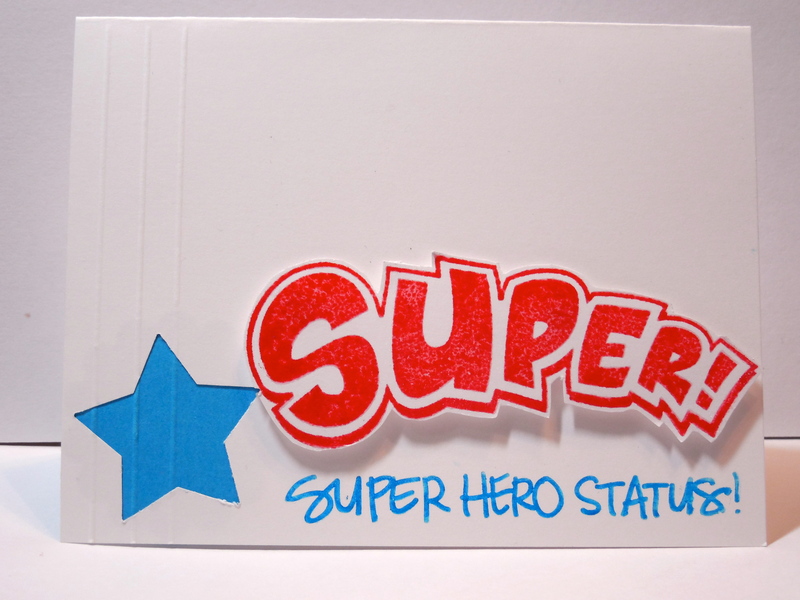 First, I used my Recollections, Comic Talk stamp set for the Super sentiment. And then I used my Simon Says Stamp, Shoot for the Stars set for the smaller sentiment is from The star punch is a Martha Stewart Punch Around the Page punch. And finally I scored my card with 3 vertical lines on the left side to create a balance point to the big, bold Super word bubble. Clean and Simple cards are sometimes a challenge for me. I always seem to add too much to them or not enough but, I think this time I got it right. This card would be fun to send to one of the guys on my list of birthdays for friends and family. Join in for a chance to win an awesome gift voucher from Ellen Hutson! I am also entering my card into the A Blog Named Hero Challenge Snip and Stick. The challenge asks that you use paper piecing on your card. Although the paper piecing technique I used was very simple, I thought I would enter my card in all the same. Posted in Any Occasion, Birthday Cards, Handstamped cards, Patriotic Cards and tagged hand stamped cards, handmade, masculine cards. Bookmark the permalink. What an awesome CAS card!! In love that “super” stamp, I’ve never seen it before! Must go look! hehe! Thanks so much for playing along with us this week at CAS-ual Fridays! Thanks, Angie! The Comic Talk set would pair well with Michelle’s Rad set nicely! Your bold colours are perfect for these sentiments. Thanks for playing along at ABNH. This one made me smile! 🙂 Great CAS card! Thanks so much for joining us over at ABNH.